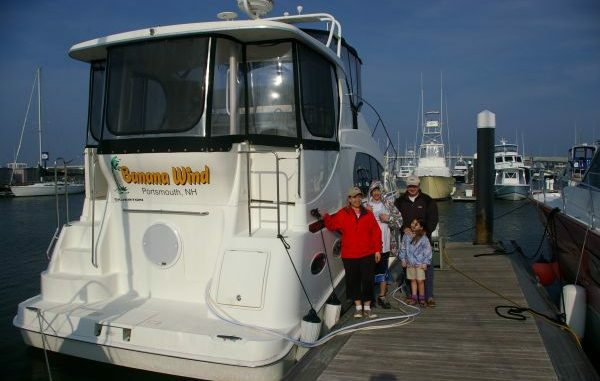 The family that purchased this boat has moved up from an Inboard/Outboard style boat and requested some training as well as delivery to their home near the US Navy Submarine Base in Portsmouth, New Hampshire. The boat was purchased in Florida and we decided to split the delivery in two legs. This first leg was from JAX FL to Charleston, SC so they could enjoy a winter vacation. The second leg of the trip will be around April so we can complete the journey to NH in better weather. We cast off lines from Sadler Marina on the Ortega River Saturday afternoon, gassed up and headed for Fernandina Beach, FL before dark. 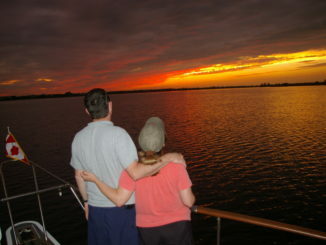 The St. Johns River was a pleasant ride, the tide was ebbing to sea helping with our speed. We turned at the ICW and went under the Sisters Creek Bridge heading north in deep water because the tide was still fairly high. We were having a typical Florida February “heat wave” and the local wetlands were full of life. We arrived in Fernandina Beach, FL well before dark so everyone went to explore the old waterfront town. At sunset we met at a waterfront restaurant to watch the sunset and enjoy dinner before shutting down for the evening. Sunday morning we cast off at first light and headed to Jekeyl Island Marina in GA to gas up so we could get a formal receipt proving the boat was no longer in FL so the owners would not have to pay FL tax. We continued north in the nice warm weather passing through the high tidal areas of GA (6 to 8 feet) and not getting close to touching the bottom! When we were near Savannah the tide was down and we could see mudflats everywhere but we were OK. As we passed Thunderbolt we noticed a family in a 20 ft outboard boat high and dry on a mudflat. I guess they were fishing when the low tide left them stuck in the mud. Fortunatly they did raise the outboard motor to prevent damage to it. I guessed they would have to wait another 4 hours before they could float off the mudflat. I’m sure they were glad it wasn’t too hot or buggy that day. 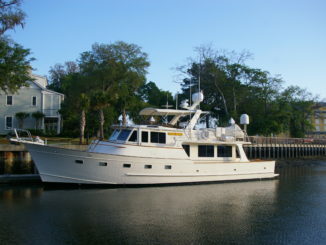 Another beautiful day of boating and we plan to spend the evening in Hilton Head Island at a fuel dock on Skull Creek. A great sunset and dinner at the marina restraurant then bed! Boating is exhausting. Monday morning we head towards Paris Island and Beaufort, SC with our 1PM landing in Charleston, SC. We gas up, pump out and move into our assigned slip. After tidying up the boat we meet for dinner in downtown Charleston. Tuesday morning I depart renting a car to drive home while the owners stay for a mini vacation in Charleston before flying back to the artic north in Feb! Later this Spring Alyse and I will complete the delivery to New Hampshire. The owners may join us in Baltimore or Mystic CN to ride the last few days. Ever wonder what it’s really like to cruise America’s Great Loop? 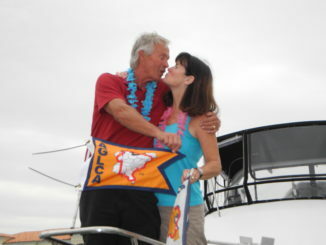 Then the AGLCA seminar, “Great Loop Cruising: A Guide to the Looper Lifestyle” is for you!